One of the 4 Miles Mogul Basics things to do is get your frequent flyer details sorted. As a kid, I used to obsess over the different pretty cards the airlines would send me for signing up to their programmes, even though I was hardly ever flying anywhere! These days I’m lucky enough to fly more, and I always want to earn the most miles I possibly can every time I fly. So know you need to punch in your frequent flyer number every time, but which airlines’ programme is the best one to credit each flight to? Let’s say you are flying on British Airways - you are able to credit the miles for that flight to ANY One World airline’s frequent flyer programme, like American Airlines AAdvantage. However, some programmes give you more miles for certain classes and distances, and sometimes you might earn nothing at all. Which programme will allow me to earn the most miles for my specific fare? Luckily - a couple of websites have popped up that can save the day here. http://www.wheretocredit.com/ allows you to pop in your flight details and it will tell you which programme will give you the most! I obsess over nabbing the best seat on a plane. Having the right seat can make all the difference to your flight experience. Most people would like a quiet location, and the most legroom, and there are resources out there to help you find the perfect seat for you! Over the years I’ve found loads of amazing tricks like flying in economy seats that have no seat in front of them and booking seats in mini cabins which are much quieter and private just like a private jet! Seatguru is backed by tripadvisor and is great for allowing you to simply punch in your flight number. It does the rest of the work (most importantly for a beginner - it works out the exact aircraft you are flying on). I find this a bit more clunky - but it reviews the pros and cons of each seat and is colour coded well. I have found the information here to be a bit more hit and miss. For example I always without fail book window seat on the right side when flying into Heathrow for perfect views over central London! However enthusiastic you are about air travel, one thing unites all travellers… the desire to turn left on the aeroplane. For me, it gives me unparalleled excitement!! Much of what I write on this blog is focussed towards attaining premium classes without paying premium prices. Upgrading Using Avios, as per this previous post, is one way of having a fully flat bed in the sky, and will extract the maximum value for each Avios if done correctly. Along with paying full whack, shameless begging, and using Avios, there are other methods of bagging an upgrade, and today I will look into Pro-active Online Upgrades (fondly known asPOUGs). Just like trying to avoid extortionate UK air taxes, there is no exact science behind chasing a POUG, but there are games to be played! What is a Pro-active Online Upgrade (POUG)? 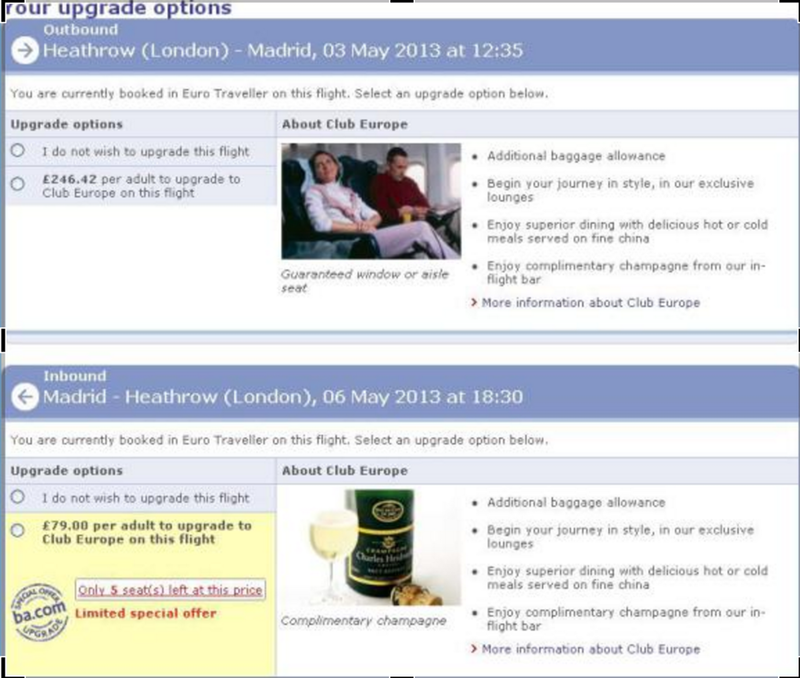 BA will charge a cash fee for the upgrade. BA may also offer similar cash upgrades in the airport at check in, and a trial of on-board upgrades is also being conducted. Now the outbound offer is nothing to shout about, but on the inbound flight, an offer of £79 may represent excellent value. I went on to check how much this upgrade would have been by simply booking business class on the website, and this would have come in at £239. This is £145 more than what I paid for my ticket. By upgrading after booking, utilising this POUG, I stand to save £66. This is on a short-haul flight. The savings on a long-haul upgrade could be more significant. So in the first instance, you should always check on Manage My Booking, by clicking on “upgrade using cash” to see if you can have yourself a bargain upgrade. Can I speculatively chase a Pro-active Upgrade?! In short, YES! As they say, you must speculate to accumulate. Here is method that can be tried, but should be exercised with maximum caution. I would only advise doing this with a flight that you definitely want to take anyway, just in case anything goes wrong. The loophole that shall become your friend is BA’s policy of allowing you to request a full refund of any flight (including non-refundable flights) within 24 hours of booking. This is in place to assist people who have accidentally booked tickets with the wrong name, or for the wrong date. However, nothing stops you cancelling if you haven’t managed to find a cheap enough POUG! 4. Check if BA are offering you a POUG, and if so, check the price. 5. If this is satisfactory, upgrade, pay, and you’ve won! It would be foolish to conduct such a plan with full confidence you will receive a refund. You should check BA’s terms and conditions carefully, and be aware that they may change. To be safe, only try this trick when booking flights you are happy to take anyway, that way, you can’t be disappointed. How much is the average POUG? WARNING – you may still earn tier points and miles in accordance with your original booking class. If you are after an upgrade, this is a method that may well suit your circumstances. It is ALWAYS worth checking both online, and at the airport. You may get lucky and get your upgrade for bargain price. Avios are collected on flights with British Airways and oneworld airlines as well as a on wide range of other purchases. These are the points that are earned on some credit cards, through Tesco Clubcard and TopCashBack. Avios can be spent on flights and upgrades. Avios can be bought and shared. Avios expire only if your balance is inactive for three years. You earn Tier Points by flying with British Airways and their oneworld airline partners (including American Airlines, Qantas, Cathay Pacific, Iberia and Qatar). All the Tier Points you've earned as a member of the Club count towards your Lifetime Tier Points total, for more recognition and rewards. TopCashBack is in my opinion the best cashback site in the UK, and has been my cashback site of choice for years. When purchasing anything online, click through to the retailers site from a cash back site like TopCashBack. The cashback site will offer a percentage cashback on any purchase you make after clicking through from the cashback site. This tracks in your cashback account, and once confirmed, can be paid out in various ways, but most simply, directly to you bank account FOR FREE! There are various different ways of being paid your cashback. The most simple is a bank transfer directly to your bank account. You can also get vouchers with retailers like Amazon and M&S and topcashback will give you a 5% bonus! You can also take advantage of this 5% bonus and get paid in Tesco Clubcard points. These can then be converted to Avios at a rate of 1:2.4! You book a week in a hotel after clicking through to Expedia from topcashback. The total cost of the hotel is £396.82. You receive 12.6% cash back for this purchase = £50.00. You transfer to your Tesco Clubcard account (1p=1 point) so with the 5% bonus you now have 5500 Clubcard points. You convert these to Avios (done quickly online or on the telephone) at a rate of 1:2.4. 13200 Avios lands in your BA Executive Club account! How do I get a £5 amazon gift card for signing up? It is completely free, you just need to sign up though my referral link by clicking here! I get a small bonus, for which I am extremely grateful, and you get your free gift card which you otherwise won’t get! I urge you all to sign up (here!) and use this for all your online purchases. My accounts have paid hundreds and hundreds of pounds which I would never have received! As always, please feel free to comment with any questions or additional tips you may have. Please follow the blog by entering your email below to get posts straight to your inbox, and follow the Miles Mogul on Facebook! The key to the deals and offers I will talk about each day will rely on possession of an American Express card. Back in the day I was singing the praises of the BMI Amex Credit Card, even though there was no referral bonus for me! Many of my early followers signed up. It was a deal without parallel, and many were devastated to see it go. One blogger (a true miles and points oracle called “Raffles”) went as far as to write a eulogy for the card. (Click here to read it). The best card for you will depend on your circumstances, and the current special offers. However right now the Preferred Rewards Gold Card from American Express is truly unbeatable for the beginner. Earn 1 MR per pound spent. You’ll also get double points on airline/foreign currency/Amex travel spend. The annual fee has been waived for the first year. The card is charge card. It therefore has no limit, but must be paid off in full at the end of each month. What can you do with membership rewards? Once your 22,000 bonus gets posted you will have a hefty chunk of points. These points can be used on the American Express website for buying almost anything, but they can be also transferred into a huge number of programmes. I have outlines some of the key ones before. This is not a comprehensive list, you’ll find them all on the Amex website. I will write comprehensively on how far these points can take you, and how to use them, but to use British Airways as an example, 22,000 Avios is enough for 2 return flights in Europe (9,000 each). Once you receive your own card, you should refer people yourself to take advantage of this offer! IMPORTANT! – Please check out all the finer details on the Amex website before signing up and make sure this is right for you. Contact me for further information or help with referrals. If you decide to go ahead, welcome to the club!